This Balance bar represents a successful day of eating for me. It's only 4 p.m. But this is a victory. I have REALLY struggled with food this week. With both my 60-Day coach and The Gunnar Challenge, my calories limits are high. Way higher than usual. 1800 - 2300 calories. My coach has me at 2100. SO, like any person with a permanently ingrained diet mentality, I don't feel like I am on a diet. And since I'm not restricting anything, I've had a hard time. Monday was ok... I was off from work, and my environment was controlled. But Tuesday... damn. I got to work and realized that my desk was full of candy and junk. I ate candy and was so mad at myself. So I ate some more! I logged it, and went to the gym later than night for a brutal workout with my new "trainer". Wednesday (yesterday) wasn't much better. I struggled with salty snacks. So I threw everything away. And I gave my assistant the "treat" stash of candy. One good thing is that on both days I honestly logged all my food into MFP. This morning I got up feeling defeated, but an email "conversation" with my coach helped me realize WHY I am struggling, and that it's normal. Well, normal for people like us. It felt good to know I'm not alone. "I think you need to just take a deep breath and focus on what you can control which is your food. I know you're a busy mom and you work a lot.. Exercise may seem hard to fit in right now? Is this an issue? Also with your exercise is it something you are enjoying (I mean as much as one can enjoy exercise lol) or are you stressing the gym? Also I know it can make for a lot of mental mud when you're eating foods that you associate with gaining, or a time you've had no control. So you have to just bite the bullet track them stay in your goal with them.. Or you'll never realize it's not the food it's the quantity and the sedentary lifestyle that's doing this to you. Trusting food is so damn hard but it's a process you're starting right now and you've got to let go and just go with it." "I think my struggle is definitely the food. I think I have been off the wagon for so long (eating whatever I want) that it's just really hard for me to reel it in without doing a restrictive diet or detox right off the bat. See, that's usually how I get going again. By being miserable for up to 10 days. It's how my brain is conditioned. Workouts are actually great right now. I'm looking forward to my gym time... I have a new gym partner (my ex husband... long story) so it's been really fun. I can also see what you mean about the mental mud. I LOVE pumpkin oatmeal. But my brain tells me that carbs are off limits and that means I'm eating bad. I DO NOT trust food. Food seduces me and lies to me. It's my secret, married lover and our relationship is always ten kinds of wrong." Today, I have stayed on track. I have only eaten the food that I packed. 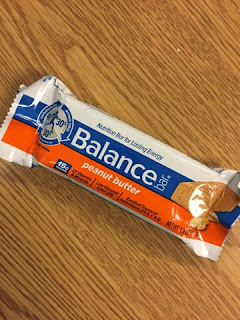 I told myself that this Balance bar would be my "treat" at the end of the day if I didn't mess up. And I didn't. So right now, I'm feeling hopeful.